There are two types of hikes: 1) regular ones, and 2) ones that take you to caves and gun batteries and secret parks and tree swings and hidden garden steps and beach graves and the city's only overnight campsite. Since it looks like you've already got plenty of the former, we're gonna go ahead and focus on the latter -- here are the 13 coolest secret things you can hike to in SF. 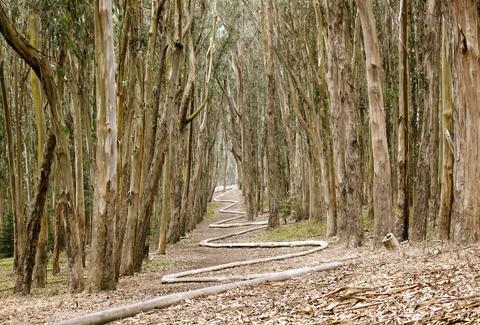 British sculptor Andy Goldsworthy kinda sorta has a thing for the Presidio. Since 2008, he has installed four works in this small, 2.3-square-mile ‘hood, including his almost-100ft-tall “Spire” (found off the Ecology Trail) and “Wood Line” (pictured above), which is found off of Lovers Lane. 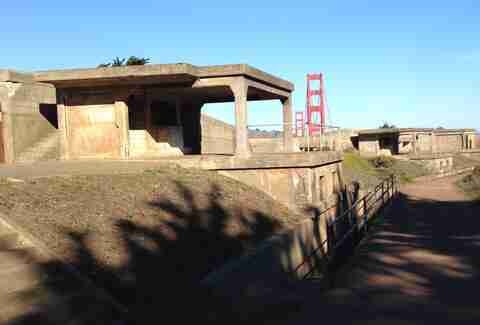 To protect the gold in them thar hills, San Francisco started building gun batteries along the coast in the late 1800s. Exactly zero of them were ever used in battle, but at least we were prepared. Today, you can check out these defunct military relics on Fort Funston’s Sunset Trail, on the Batteries to Bluffs Trail, and on Baker Beach. So, how many friends and family members have you had to cart out to Muir Woods to see the redwoods? I’ve personally stopped counting. 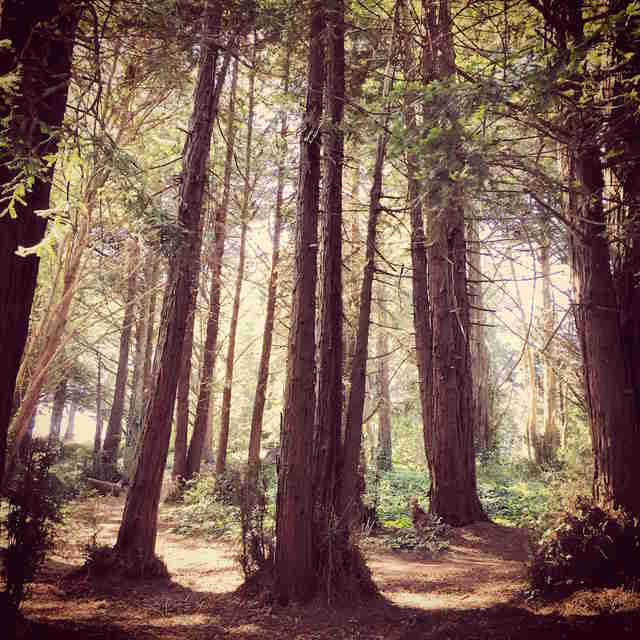 Next time someone comes to visit, skip the bridge traffic and tourists and head to lesser-known (and much closer) redwood groves in Golden Gate Park, McLaren Park, and the Presidio. While San Francisco is full of tech companies big and small, some of our roads are decidedly low tech. That’s right -- the city still boasts a few dirt roads. So far, I’ve found six of them: you can read about five of them here and the sixth can be found on Argent Alley near Twin Peaks. 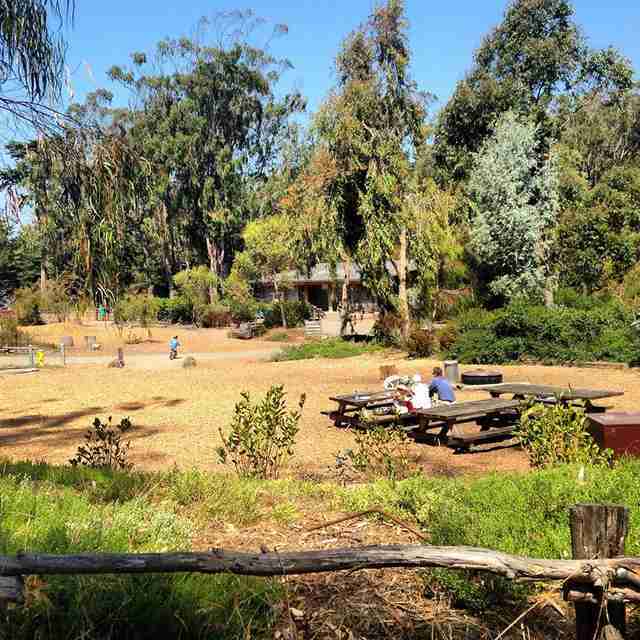 Perched atop the highest hill in the Presidio, Rob Hill Campground is the city’s only overnight campsite. 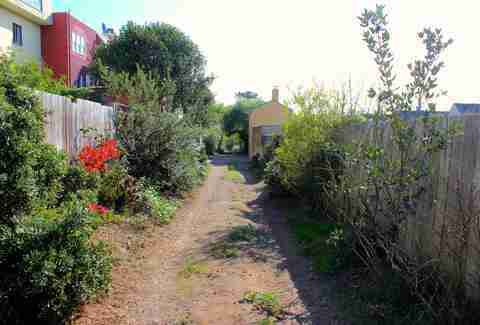 This spot is a 12-minute walk from Baker Beach and is also accessible from the Juan Bautista de Anza Trail. The single best feature of this campsite IMHO? You can Uber home in 10 minutes if Karl the Fog attacks. 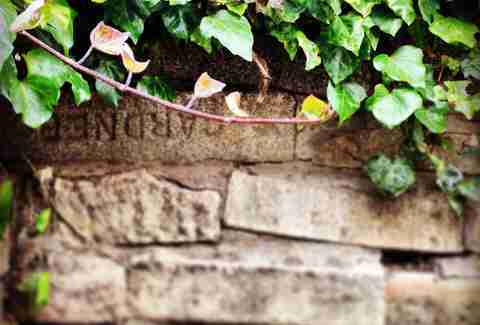 When San Francisco cleared out its cemeteries in the early- to mid-1900s (moving many of the deceased to Colma), the city found itself with a surplus of... headstones. Many were thrown in the ocean, while others were used in construction. If you look carefully, you’ll find some of these old headstones on beaches, in parks, in stone walls, and on the walkway leading to the wave organ (which itself is partially made of tombstones). By now, you may have already visited the Sunset District’s 16th and Moraga Tiled Steps Project and maybe even the Hidden Garden Steps. 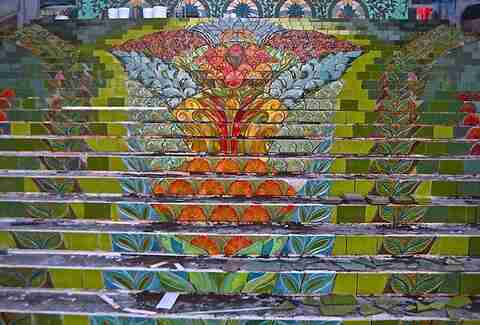 But now, we have two even-newer mosaic stairways to visit. Next time you’re bored on the weekend, check out Sea Cliff’s Lincoln Park Steps (one block from the Lands End Trail) and Bayview’s Arelious Walker Stairway (a short walk from the India Basin Shoreline, the Bay Trail, and Heron’s Head Park). 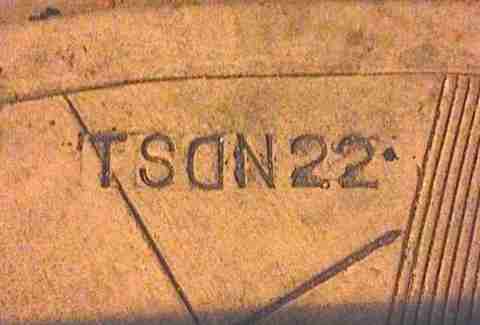 Why look down at your phone on your next "urban hike" when you can instead look down at countless spelling errors cast into the concrete of our sidewalks? Collect them all! San Francisco’s Rec and Park Department runs more than 35 community gardens where residents can grow produce and flowers. Some of these are great little getaways in and of themselves. 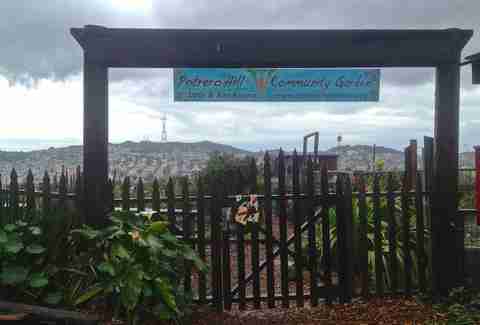 Two of the best are the Visitacion Valley Greenway -- a series of six community gardens just downhill from McLaren Park -- and the Potrero Hill Community Garden with views of the Mission and Twin Peaks. 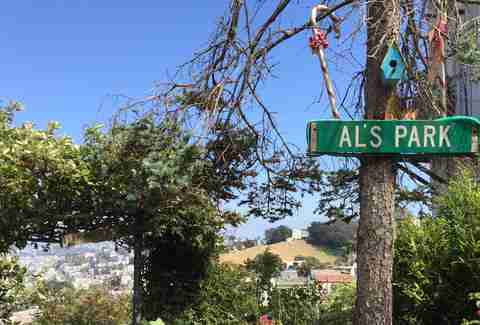 Just downhill from the intersection of Corbett Ave and Clayton St is Al’s Park, a tribute to whimsy tucked between two unassuming Castro houses. 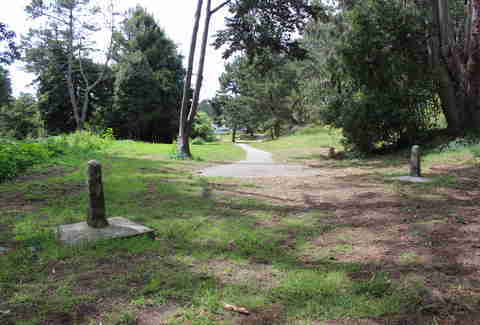 Look for a red bench and a sign and walk right into this unofficial park to discover found art, plantings, and views. Don’t look on Google Maps for directions though -- this park’s existence has barely left a trace on the Internet. If you’re anything like me, you resented the fact that recess ended in elementary school. Now, you can make up for lost time on the swings in the city. Or rather, cave, since there's actually only one in SF. Alexandra Kenin is the founder of Urban Hiker SF. She's writing a book on hiking in San Francisco that will come out in fall 2016. You can sign up for book updates and special offers here.